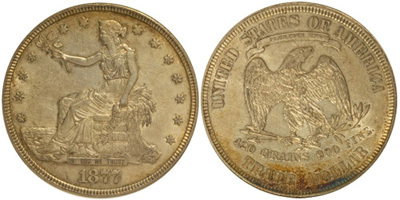 The Trade Dollar was authorized and first minted in 1873 in order to create an American coin to compete with other favored forms of currency in the Orient. The coins were produced in quantity at the Philadelphia, San Francisco, and Carson City Mints until 1878, after which point, the Philadelphia Mint continued to strike the coins for a number of years in proof format only. Depicted on the obverse of the coin is Lady Liberty seated on a bale of merchandise with her right hand holding an olive branch. She appears to be at a coastline with the sea before her. On the reverse is a bald eagle holding an olive branch and bundle of arrows. The weight of the silver content is included specifically as “420 grains 900 fine”. This represented a slightly higher silver content than the previously issued silver dollars. The coins had a very interesting history as they were initially legal tender for payment of up to only five dollars. Eventually, the legal tender status of the coins was revoked. Overseas the coins did achieve some measure of success, where they circulated and were heavily chopmarked. Collectors of the series can acquire most dates in circulated condition, but higher grades are often elusive since so few of the coins were initially saved. The lower mintages generally took place at Carson City. The true rarities are the proof only issues of 1884 and 1885, which were struck under unusual circumstances. There are just 10 and five pieces which exist for each date.